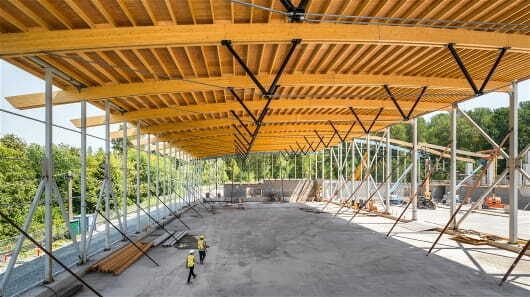 StructureCraft worked alongside Francl Architecture, Bogdonov Pao, and Lark Group to engineer and build the hybrid timber/steel roof structure for the three rinks in North Surrey. 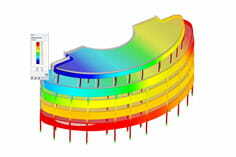 StructureCraft completed the design and procurement of the roof structure. Installation of the roof structure took 10 weeks, beginning in June 2018 and finishing in September 2018. The long-span hybrid timber/steel trusses consist of a double glulam top chord, steel rod tension chord, and HSS king posts. There are 11 trusses per rink and the secondary frame consists of double span pre-fabricated timber panels. 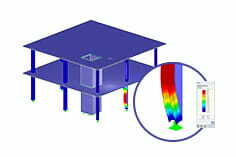 The StructureCraft engineers used RFEM for the analysis of each truss system, determining the main member stresses as well as performing a stability analysis using RF-Stability. The complex is scheduled to open in September 2019.